Sadly, I boarded a plane and headed back from Colombia this morning. Of course, being a part of the flight safety watch list (long story—starts with a carry on, ends with a butcher knife and interrogation), I was searched several times, holding up the entire group I traveled with. They unpacked and unfolded every piece of clothing in my luggage twice, and they questioned me relentlessly at customs, while the rest of my friends just walked through with a “welcome back.” It was frustrating, but all the hold ups at the airport gave me time to ponder whether or not I would resume my carb-free 4-hour body diet when I got home. I had been pounding arepas, fruit, and chocolate to the face all weekend and didn’t seem to look any different. I certainly felt different though! I felt alive again—like someone had given me a blood transfusion and injected me with energy and pure life. Carbs are the fuel of my existence and the source of my happiness. I will not go without them ever again! So the first thing I did when I got back to Miami was go get a delicious fully carb-loaded sandwich. What does fully carb-loaded mean? It means I got white bread, not wheat. It means I ate both sides of the bread, instead of open face. It means I got breaded and fried chicken on that sandwhich, instead of grilled chicken. Carb on top of carb….two are always better than one! This sandwich sounds a bit gross and overwhelming, I know. But it was absolutely divine. 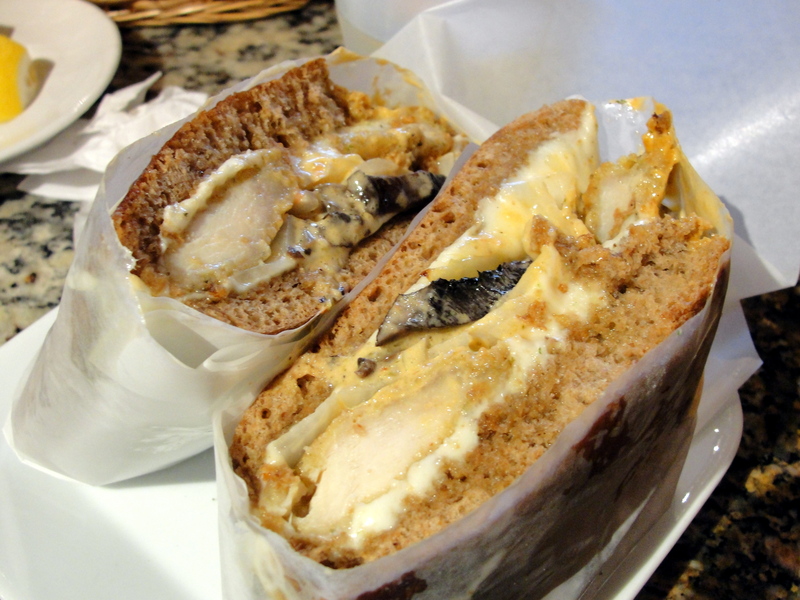 It is called the Chicken Louie Louie from Gusto Fino Itlaian Deli in Miracle Mile. The Chicken Louie Louie, is a hot sandwich with breaded chicken strips, sautéed onions, Portobello mushrooms, melted mozzarella cheese, and a creamy marsala sauce. Cheers to ending that carb-free diet! That sandwich was awesome. The creamy marsala sauce (which I had some skepticism about) was incredible. Totally buttery and fattening, but you got to walk into this meal knowing that your going to waste you’re entire days with of calories on one sandwich. The bread that the sandwich was served on was also fabulous, a little thick for my liking, but since I’ve been depriving myself of carbs for so long, I ate it! It’s rare to get such good bread in Miami, so I was most impressed by that. I was also thrilled with the meal because it was served piping hot! I had to wait for the sandwich to cool off before eating it, and I love hot food, so brownie points for that! 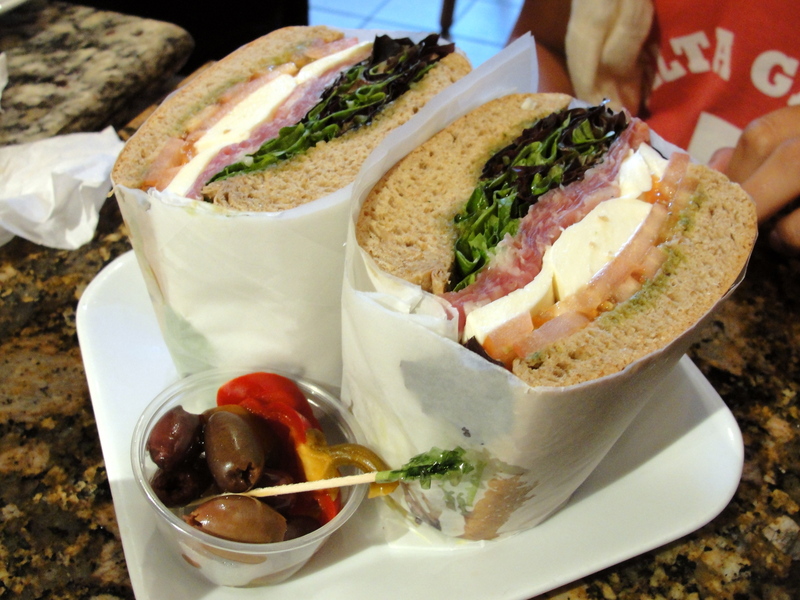 My roommate, Ariana ordered the Mario’s Ultimate, which is a cold sandwich served with parma proscuitto, fresh mozzarella cheese, pesto sauce, tomatoes, and arugala salad, topped with olive oil and balsamic glaze. It was tasy, but paled in comparison to the Proscuitto Sandwich from La Sandwicherie. We have gotten so accustomed to our proscuitto sandwiches with their delicious secret sauce, that this one felt lacking without it. She actually took it home and put our stash of secret sauce (we steal a bottle from La Sandwicherie every time we go) on the sandwich and ate it for dinner! Overall, this place has an enormous menu and you can get an extraordinary amount of food for just $10. There are combo options for soup and a drink for just $1.69 extra. It’s such a great value for your money, and its always refreshing to see a deli joint in Miami!